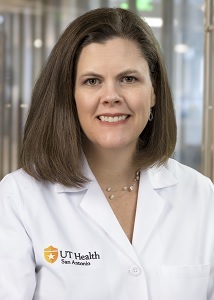 New Department of Occupational Therapy clinical faculty member Laura Novak, OTR, is developing the new occupational therapy services program at the UT Health San Antonio Glenn Biggs Institute for Alzheimer’s and Neurodegenerative Diseases. Nova joined the department in July. She has 18 years’ experience as a clinician, primarily within the geriatric population, and is pursuing her clinical doctorate in occupational therapy. “I have absolutely fallen in love with working with that population,” said Novak, who began working with the geriatric population as a certified nursing assistant in a nursing home. In her role at the Biggs Institute, Novak will work with people living with dementia and their caregivers, with the ultimate goal of maximizing their ability to participate in meaningful activities. “We work to promote safety and their overall quality of life,” she said. Preventing falls by removing clutter or placing grab bars is one step that can help clients, as is educating caregivers to allow for extra processing time and to sit with their loved one and speak in front of them so they can see and hear. “If they are asking what they want for breakfast, give them adequate time to respond,” she said. The Institute will provide comprehensive care for people living with dementia and their caregivers, which will help ease the burden of finding and coordinating care. Clients and their caregivers will be able to attend clinics to receive services and education from professionals in a range of specialties, including neurology, palliative care, occupational therapy, psychiatry, and social work. The Institute will hold its first comprehensive clinic on Dec. 7.